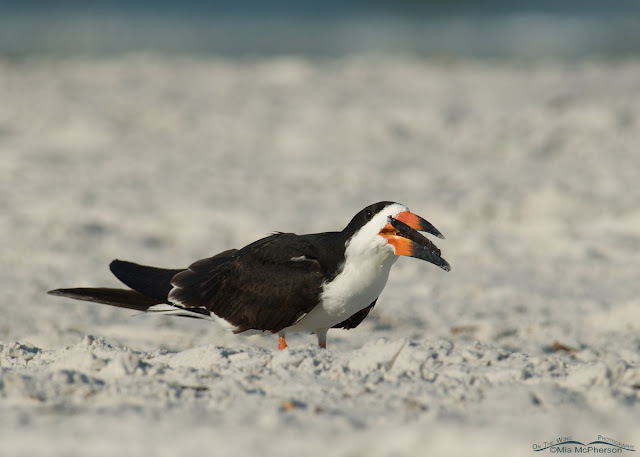 On April 30, 2008 I was photographing Black Skimmer (Rynchops niger) on the north beach of Fort De Soto when one of the birds started exhibiting a behavior that I had not seen in Black Skimmers before. 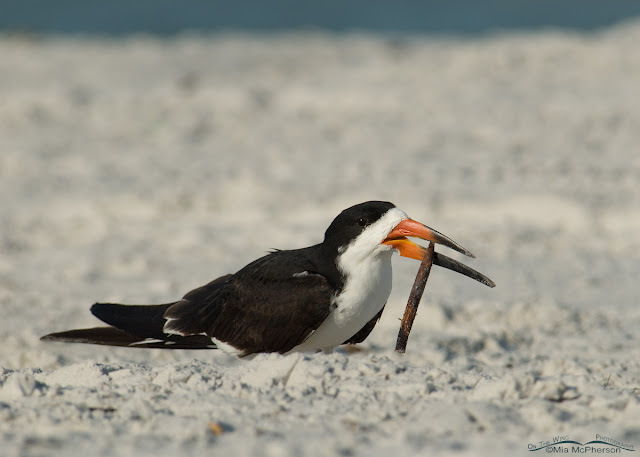 There are times when the male Black Skimmer passes a fish, leaf or twig to the female skimmer before copulation but in this case there weren't any other Black Skimmers within 20 to 25 feet and they weren't paying attention to this bird at all. It was breeding season. 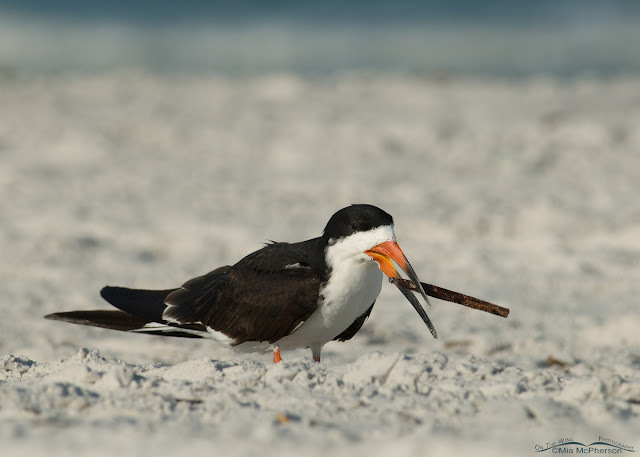 The Black Skimmer had a Mangrove seed pod in its bill and it was twirling the seed pod with its bill, at times the seed pod even went over the top of the bill but unfortunately I didn't get any images of that. The images below are posted in sequential order. 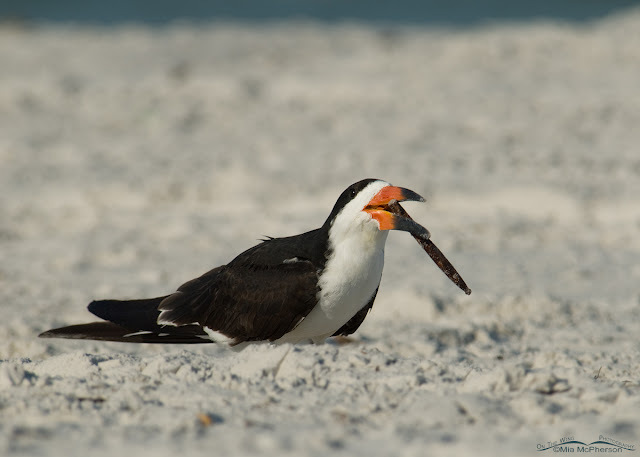 I never saw this behavior exhibited by a Black Skimmer after this event. I researched Black Skimmer behavior on BNA (Birds of North America) and there is no mention of Black Skimmers twirling objects with their bills. The seed pod twirling was fascinating and since that time I have been curious about it. If anyone has an idea why this bird twirled the mangrove seed pod around, I'd love to hear from you. Please share it with everyone at BiF! 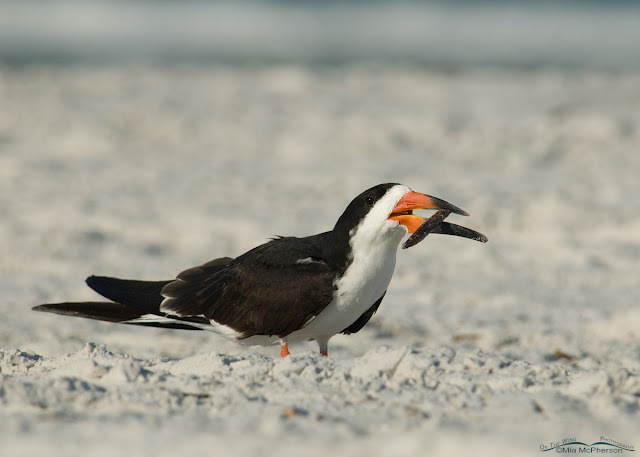 Do you think it was practicing show it can more quickly align and swallow fish? I'll throw that guess out there. Thanks Laurence. This is an adult bird so practicing food alignment seems like it wouldn't be needed. I just thought it was a reincarnated George Burns smoking a cigar. I'm with Laurence on fish-swallowing practice. I also thought the mangrove seed pod looked like a cigar. 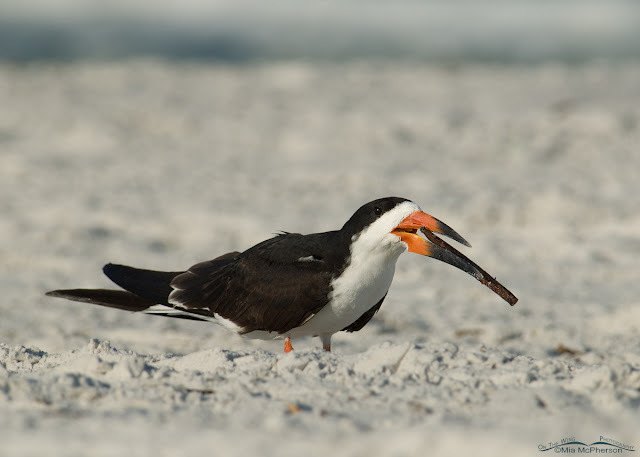 This is an adult bird in breeding plumage though so I don't it was practicing fish-swallowing. One of life's mysteries perhaps. 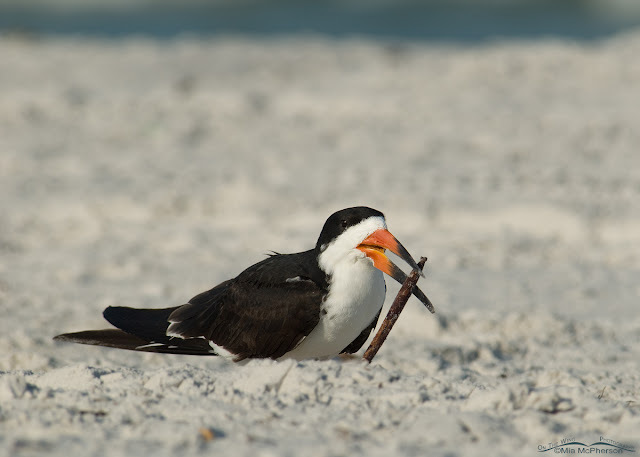 Thanks for the giggle Bill, I pictured the Skimmer and friends marching down the sand to music. The Skimmer with the Tuba needed help though! Fascinating series, Mia. I was thinking of playing and entered it into Google Search. 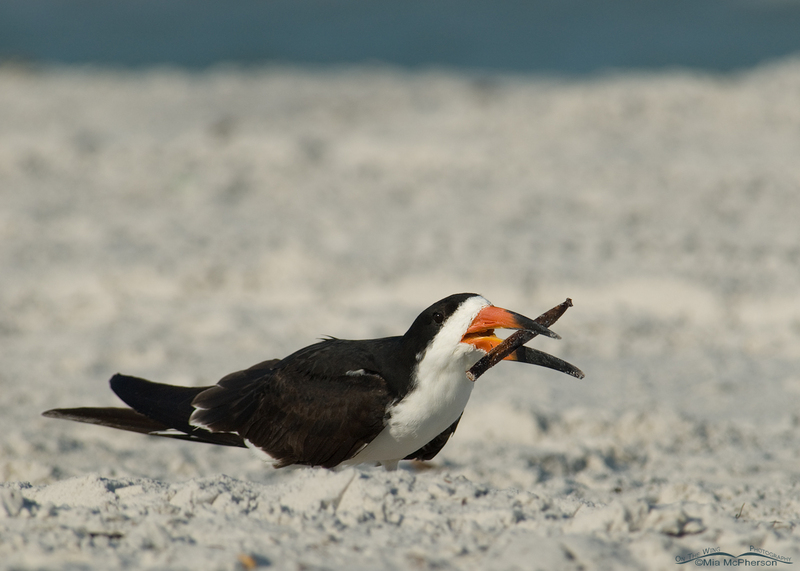 Came up with this photo: http://www.flickr.com/photos/-jon-/5098412278/ Playing is often a form of practice for young birds although yours doesn't look like a juvenile. 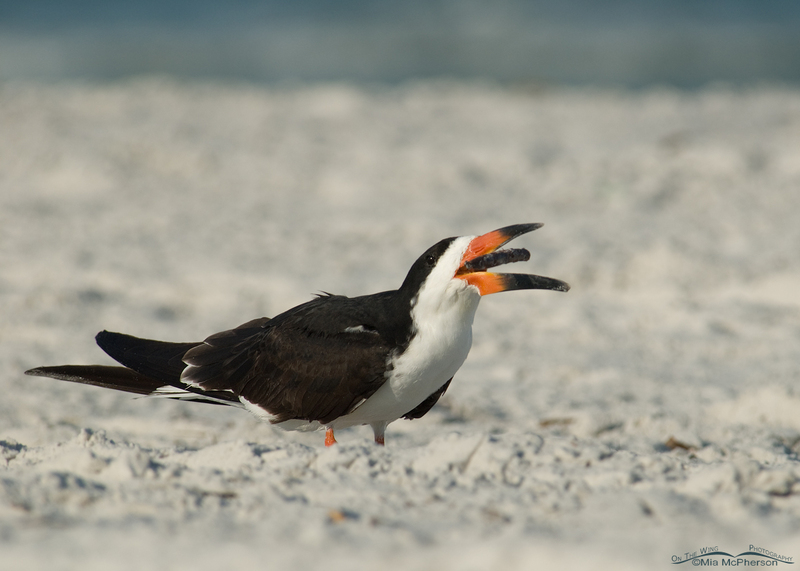 You are right Hilke, this is an adult bird in breeding plumage. I'm starting to wonder if the bird might have been practicing some sort of mating display. This I have not seen before, a special but beautiful bird that you have photographed in an excellent way. Great series, Mia! The skimmer is certainly trying to do something with the pod, practicing to eat a fish seems very likely. Great photos Mia! 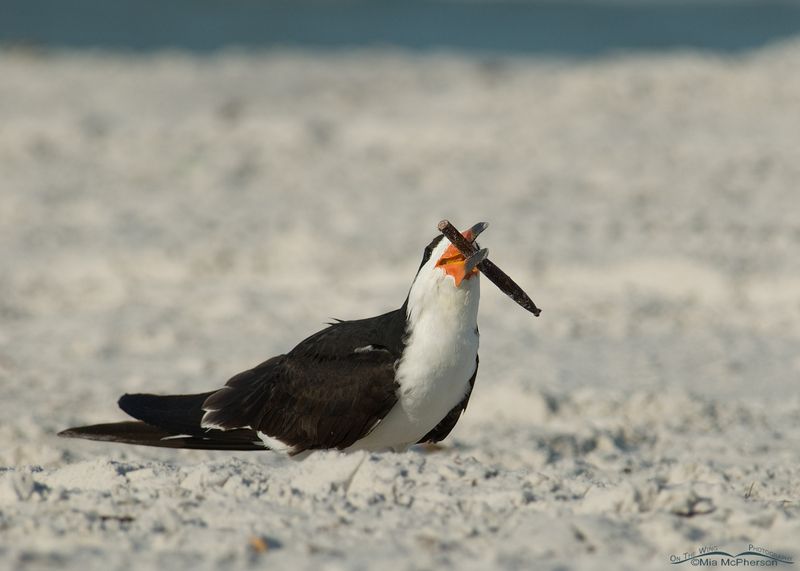 I have seen young Terns play with mangrove seed pods before, but never a Skimmer! Thank you Tammy, it was interesting to see this behavior. Thanks Adam, they are neat birds. Thank you Giancarlo. So three of us now think it looks like a cigar! Very interesting behavior you witnessed. Great documentation through your wonderful photographs, Mia! I really am curious as to what this skimmer was doing.